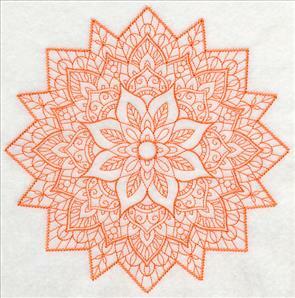 Stunning, intricate Mehndi designs are fabulous additions to any embroidery project! 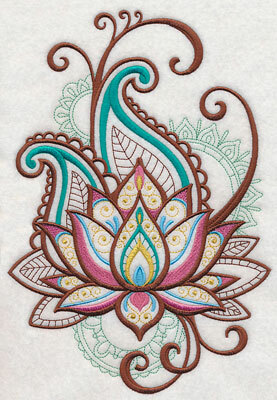 Mehndi designs are inspired by traditional Hindu art. 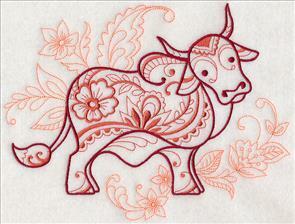 This form of Indian art is most recognizable by its use of beautiful, in-depth detail and complex patterns. 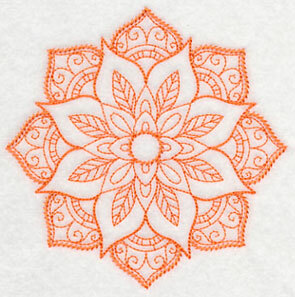 Henna paste is used to draw this form of art onto arms and hands for special occasions in the Hindu culture. 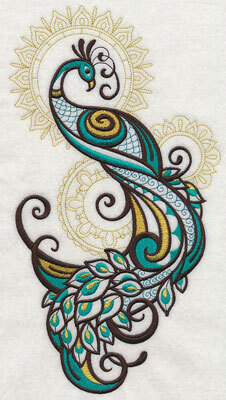 These designs embrace the motifs and intricate detail of classic Mehndi artwork. 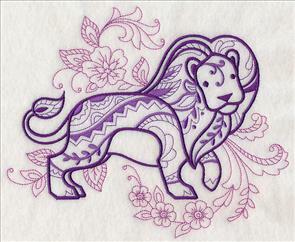 Stitch Mehndi animals onto tote bags, a beautiful Mehndi flower onto a pillow, or create a lace Mehndi medallion! 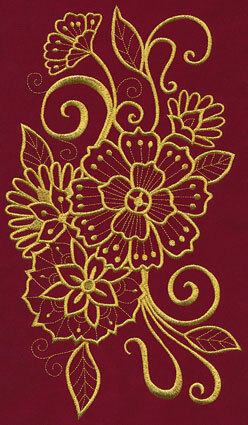 Plus, all-new goldwork designs featuring florals and flourishes celebrate the beauty of Indian culture. 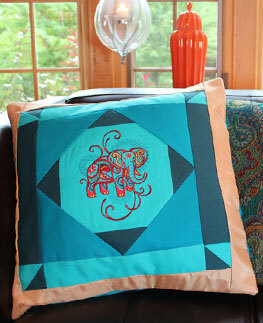 A beautiful jewel pillow is the perfect place to show off Mehndi embroidery. Stunning patterns, vibrant colors, and intricate detail inspired by classic Mehndi artwork give these striking embroidery designs a unique and eye-catching appeal. These designs use metallic thread for an extra touch of elegance; click here for step-by-step instructions for using metallic thread or here to watch our video. 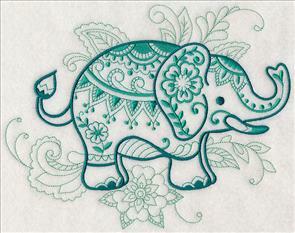 6.48" x 11.71" and 5.20" x 9.40"
4.32" x 7.81" and 3.80" x 6.88"
An elephant, a peacock, and a lotus flower are traditional motifs found in the Indian culture, and are perfect representations of the Mehndi style. 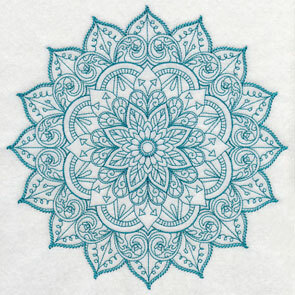 The sophisticated designs are a great way to celebrate the exquisite Hindu art form. 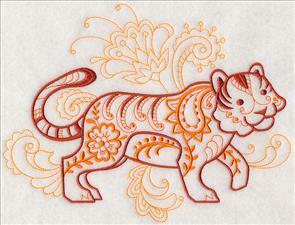 6.90" x 10.01" and 5.86" x 8.50" and 5.37" x 7.79" and 4.73" x 6.86"
Adorable and intricate Mehndi animals are a great way to add traditional style to your embroidery projects. 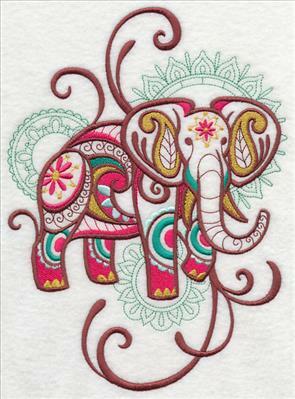 Each of the animals feature classic Mehndi lines and details, and are fabulous additions to tote bags, pillows, kids projects, and quilts. 8.71" x 6.90" and 7.81" x 6.18"
6.94" x 5.50" and 6.13" x 4.85"
8.33" x 6.90" and 7.50" x 6.21"
6.64" x 5.50" and 5.86" x 4.85"
The Mehndi animals are stitched in bold, thick lines in the foreground with a muted embellishment in the background for added beauty and detail. 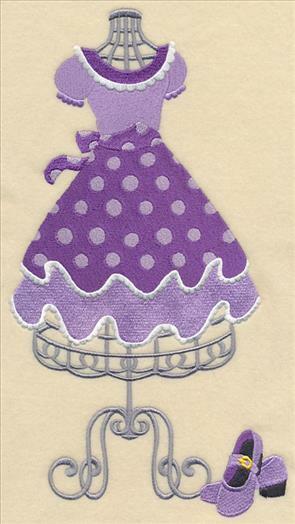 Terrific for adorning garments, home decor, and more. 9.06" x 6.90" and 7.80" x 5.94"
7.22" x 5.50" and 6.37" x 4.85"
8.65" x 6.90" and 7.80" x 6.22"
6.89" x 5.50" and 6.08" x 4.85"
Pick your favorite animal, or stitch them all to make a dazzling mini quilt, collection of framed pieces, or corresponding set of tea towels. 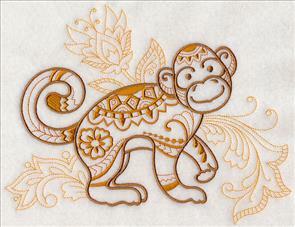 We love using all the Mehndi animal designs together! 8.77" x 6.90" and 7.80" x 6.14"
6.99" x 5.50" and 6.15" x 4.84"
9.04" x 6.90" and 7.79" x 5.96"
7.20" x 5.50" and 6.35" x 4.85"
These Mehndi animals are perfect for your next embroidery project. Buy them all in a design pack! 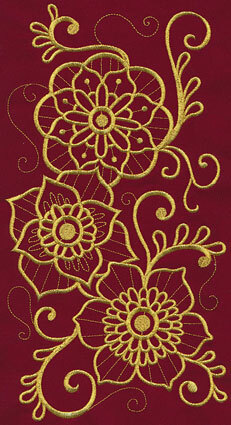 Stunning goldwork lets the beauty of Mehndi artwork shine in these gorgeous designs! 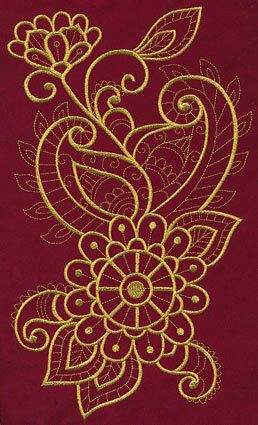 Intricate flowers and flourishes fill the Indian-inspired designs with grace and elegance. 6.38" x 11.75" and 5.11" x 9.42"
4.24" x 7.82" and 3.73" x 6.86"
6.85" x 11.59" and 5.57" x 9.41"
4.62" x 7.81" and 4.05" x 6.85"
Each of these goldwork designs uses metallic thread to add a bright and shimmering look. For tips and tricks on metallic thread, click here for step-by-step instructions or here to watch our video on stitching with metallic thread. 6.83" x 11.75" and 5.47" x 9.41" and 4.54" x 7.81" and 3.99" x 6.86" and 2.26" x 3.88"
These Mehndi designs are a magnificent way to add an exquisite touch to your embroidery projects. 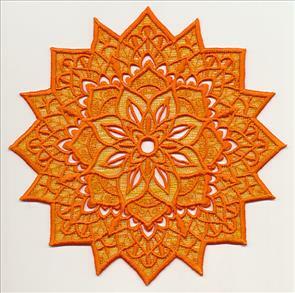 Stitch them on quilts, purses, pillows, and more as a stunning adornment. 11.75" x 4.42" and 9.41" x 3.54" and 7.81" x 2.94" and 6.86" x 2.58" and 3.87" x 1.47"
The rich, ornamental feel of these goldwork designs mimics the style and beauty of the Hindu culture. Add the chic designs to apparel, table linens, and other home decor projects for a glamorous look. 11.75" x 5.15" and 9.41" x 4.13" and 7.81" x 3.43" and 6.86" x 3.01" and 3.87" x 1.71"
Stitching using metallic thread can be difficult to master. 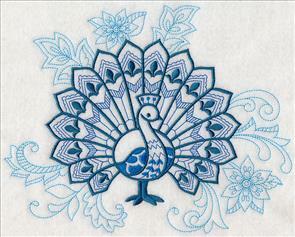 Get the insider information on this embroidery technique by reading these instructions for stitching with metallic thread or watching our video on this type of material. 11.75" x 4.80" and 9.42" x 3.85" and 7.82" x 3.19" and 6.86" x 2.80" and 3.87" x 1.58"
A sun and moon design stitched in the Mehndi style are terrific additions to a wide variety of embroidery projects. 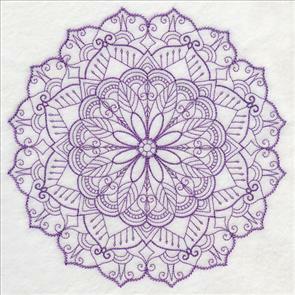 The complex detail and patternwork plus the variety of colors found in these designs give them a unique, sophisticated look. 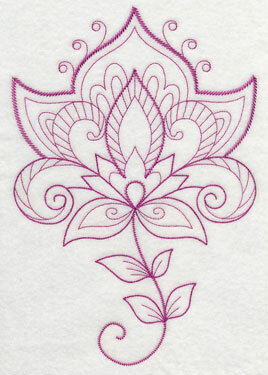 The flourishes and delicate linework in these designs give them a distinctly Mehndi appeal. 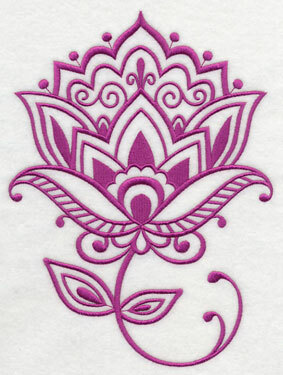 The flowers are a beautiful way to honor the Hindu culture in your embroidery. 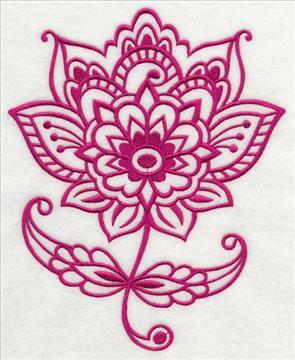 4.85" x 6.27" and 3.01" x 3.88"
Stitch these intricate flowers as additions to pillows, denim jackets, aprons, towels, and more. 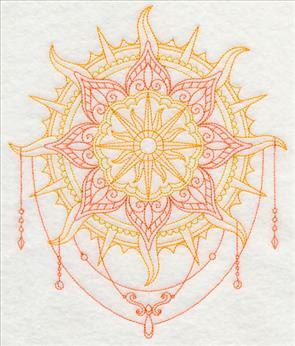 They add a bright and beautiful look to any embroidery project. 6.85" x 8.42" and 6.36" x 7.81" and 5.86" x 7.20" and 4.86" x 5.97" and 3.16" x 3.88"
A vintage-style approach gives these Mehndi flowers a light and lovely appearance. 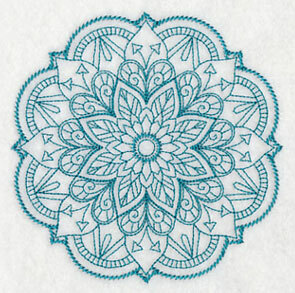 Bonus: Because each of the designs only uses one color, they're delightfully quick-to-stitch, too! 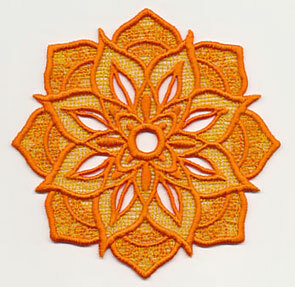 4.86" x 5.81" and 3.22" x 3.87"
Stitch the vintage-style flowers on quilt blocks, table linens, tea towels, and t-shirts! The light and open areas make these designs excellent choices for smooth, neutral fabrics. 6.89" x 10.07" and 5.85" x 8.53" and 5.35" x 7.80" and 4.73" x 6.88" and 2.69" x 3.88"
These medallions show off the classic elaborate detail and patterns found in traditional Mehndi art. Because the designs are so beautifully detailed, each of the two smaller sizes feature a simpler style of the medallions. 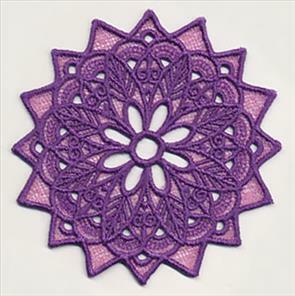 4.90" x 4.90" and 3.90" x 3.90"
Stitch the larger, more detailed medallions alongside the simpler versions for a complementary look, or pick the design that fits your project and stitch that version alone. 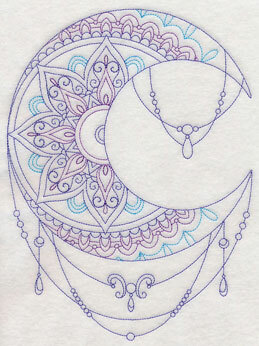 The Mehndi medallions are striking either way! 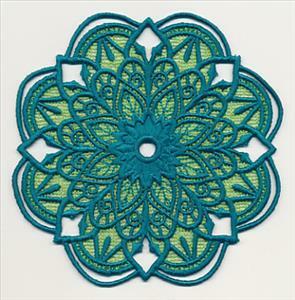 4.87" x 4.87" and 3.87" x 3.87"
Each of the medallions embody the splendor and magnificence of the Hindu culture, and are stunning additions to your embroidery projects. Add them to tea towels, aprons, table linens, apparel, and tote bags. 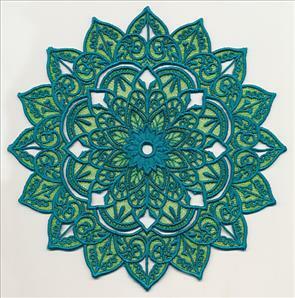 4.90" x 4.89" and 3.85" x 3.84"
The Mehndi medallions also come in a gorgeous freestanding lace versions. 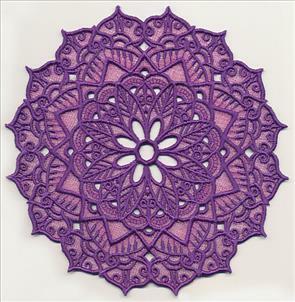 These lace designs use two different colors for added appeal. 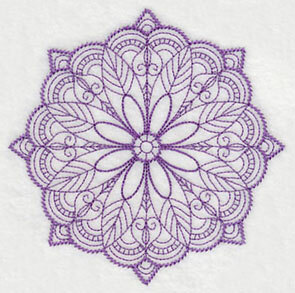 Click here to learn how to embroider multi-color lace. 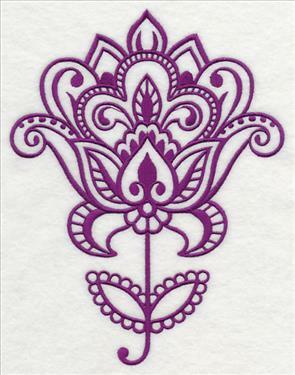 4.78" x 4.83" and 3.87" x 3.89"
Freestanding lace designs are a gorgeous way to embroider, and can be utilized for many different projects. Use them as coasters, sew them onto a pillow, or hang them in the window as a suncatcher. 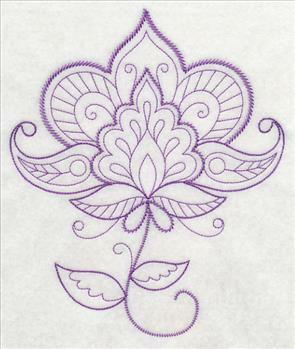 4.90" x 4.93" and 3.86" x 3.89"
These freestanding lace designs are an excellent way to bring your embroidery to life. 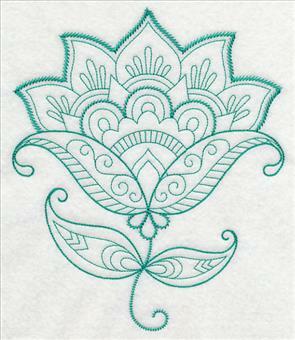 Learn our best tips and tricks for how to embroider multi-color lace by following these project instructions. 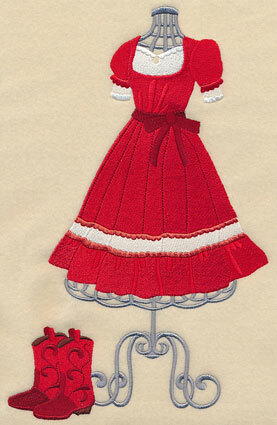 4.84" x 4.86" and 3.86" x 3.88"
Linda is a big fan of our other dress form designs, and was excited about the possibility of adding a square dance dress form to the group. Two different versions of square dancing costumes give even more variety -- thanks for the suggestion, Linda! Stitch these fashionable designs on tote bags, mini-quilts, and more.